Drawing on three decades as a major film industry screenwriter and 20 years leading seminars and workshops around the world, a HartChart masterclass provides a 1-2 day immersion in HartChart visual story mapping tool directly with J.V. Hart, while communing with other writers as you learn to get your script production and market ready. Join us for a special MasterClass in LA, September 29th, 2018! 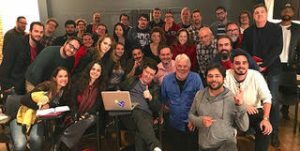 Drawing on three decades as a major film industry screenwriter and 20 years leading seminars and workshops around the world, J.V. 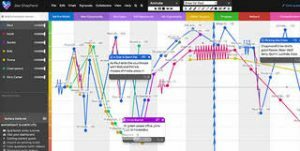 Hart has created a full day immersive experience using the HartChart visual story making tool to give you hands on experience getting your script production and market ready. Ask questions, exchange ideas and work with J.V. Hart in a roomful of writers facing the same issues we all do. As the day progresses, you will discover how to get to the heart of your story and visually map the rise and fall of your character’s emotional journey toward a satisfying ending, every time. This class will be held at one of our very own Hartcharters’ downtown garden rooftops overlooking Los Angeles. Food and drink will be provided, and, at Sunset, a masterclass tradition, a glass of Primitivo Red to toast our brain blizzards and no blank pages. The class is limited to the first 25 writers who sign up. Join us on this next adventure in the screentrade. · Free copy of the revised HartChart Toolkit. Yes, I agree to HartChart using this information to respond to my inquiry via email. Yes, I agree to HartChart using this information to respond to my inquiry via phone. We take your privacy seriously and will only use your personal information to contact you in regards to this inquiry. If you agree to allow us to use this information to contact you, select the option above.